Indispensable tools for anyone considering stained glass work as a serious hobby. For breaking glass along a score line that is at least 1/2" from the edge. The lower jaw is convex and forms an anvil for the upper concave jaw. When even pressure is exerted equidistant from each side of the score, it causes the glass to run along the score. Consider this the big sister of #6848. Made of plastic reinforced with glass fiber. Very tough and durable. Made with interchangeable jaws so you can convert from running to nipping. 8' long. Made of plastic reinforced with glass fiber. Made with interchangeable jaws so you can convert from running to nipping. Very tough and durable. 6" long. 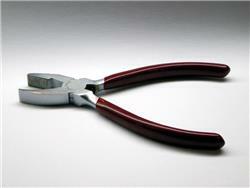 Glass pliers are constructed so that the jaws are parallel when they are slightly open. This feature allows you to grip the edge of the glass firmly, enabling you to remove strips as narrow as 1/8" from the glass, once your cut has been made. 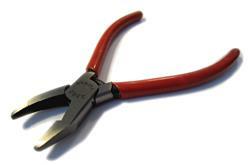 These pliers are also suitable for grozing or nibbling off tiny pieces of glass whether or not a cut has been made. 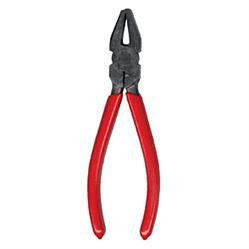 The 1/2" jaw on these breaking pliers is wider than your typical hybrid breaker/grozier pliers, so they work nicely on those long straight scores. 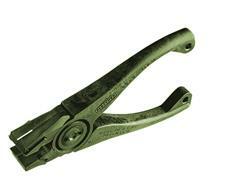 Comfortable grip, 6-1/2" long, imported. New! 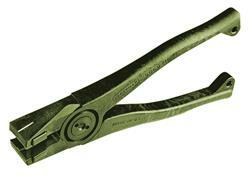 CRL flared jaw glass pliers, 8" long, with wide 1" jaws for gripping large segments of glass. Strong and durable, made from precision machined solid steel. Imported. New! These mini grozing pliers are just the ticket when you want to nibble away that last annoying little itty-bitty shard of glass from your otherwise-perfectly cut piece of glass. 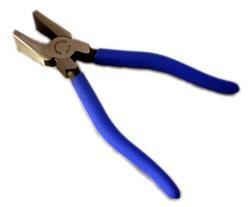 These pliers also come in handy for shaping tinned copper wire into lovely curlicues (that's "curly Q's" for those of you who spell barbecue "BBQ"). 6" long. 1/4" jaw. Imported.